These are the cuddliest cacti around! Pet ’em, squeeze ’em, accidentally brush against them- no pricks! Plus, they’re even heartier than their living counterparts, so no lack of watering or sunlight will do them in! 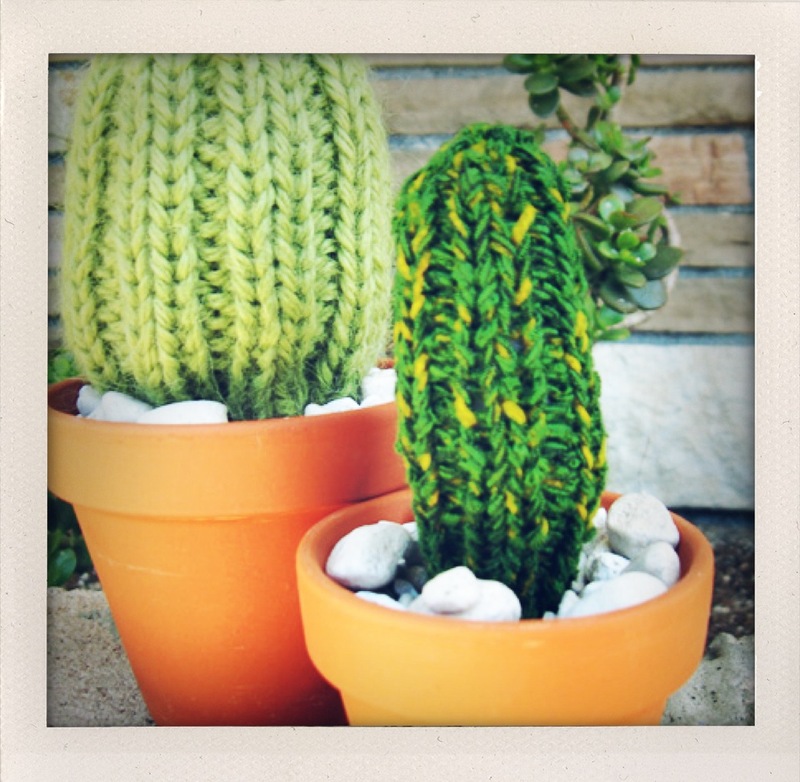 The cactus is knit flat and then seamed and stuffed. This pattern is very easy to alter and customize. Try out some different stitch textures if you’re feeling adventurous, like seed stitch, or maybe even a simple old garter. You can get all of that weird floral stuff at Michael’s. The floral foam is basically green styrofoam that will shed a bit, the floral picks are green wooden giant toothpicks, essentially. In place of floral picks you can probably use a pencil or a knitting needle, or a part of a wire hanger. You get the idea; something rigid and pointy. Row 1: (K1, p2) repeat until 1 stitch remains, k1. Row 2: (P1, k2) repeat until 1 stitch remain, p1. When you reach 5 inches, work Row 1 one more time. Decrease Row 2: P2tog until 1 stitch remains, P1. Slip all your stitches onto your free needle so that the yarn is now attached to the bottom stitch on the needle. Cut yarn from ball, leaving a 12″ tail. Thread tail onto jumbo darning needle and slip all of the stitches onto the tail, stretching the yarn across the back of the knit piece, lifting each stitch off of the needle and onto the tail yarn as you go. When you have slipped the last stitch, pull the yarn tight like a drawstring and sew a seam down the side of the cactus. Stuff with fiberfill. Cut your pot-filler to fit tightly inside of you pot . Use the stick to poke a prep hole in the filler. Insert the stick into the stuffing to hold the cactus up. Insert the stick end of the cactus into the hole. Arrange the stones around the bottom of the cactus. Voila!